Saigon Scooter Centre was established in 1997 by Patrick Joynt. Pat, originally from the U.K, has been a scooter enthusiast since early childhood. 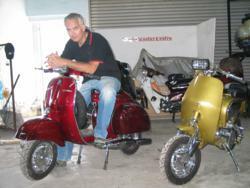 Owning his first scooter (Vespa p200e) at the age of 13 and later getting involved in British scooter rallys of the early 80s was quickly hooked into the Scooter Scene. After a decade of scootering a Euro tour was planned on a Lambretta GP200 which ended up in Corfu. Following another few months to head back to the Uk via Eastern Europe the trusty scoot limped back home but was then followed up with an overland Landrover trip to India. Pats travels found him 2 years later in Vietnam in 1997 for a 3 day visit after dodging rockets in Cambodia! Whilst traveling in Vietnam, Pat realised an opportunity to create a business which would combine both his business ambitions and passion for scooters. Coming from a retail management/ customer focused background, Pat had a clear vision of what he wanted to achieve. Our success and expansion over the past 22 years has been a combination of hard work, skilled workmanship, quality products , innovative designs and a professional energetic team. 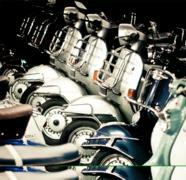 Our head mechanic has over 35 years experience in the scooter industry and the core team have now worked together for over 10 years. As our resident mechanic he continues to emphasise the importance of detail and western standards to all our trained staff. We also currently employ 18 full-time staff. A new addition to the team is William Sykes from the USA who is involved in the technical ,design and development concepts for the new range of electric classic conversions the VTronic and EBretta scooters. Also on the team is Mark Devine, growing up in the U.K before later moving to the U.S. His expertise in graphics and web design was the final ingredient needed for the successful management team. Over the years SSC has continued to expand, recently moving its workshop to a new larger premises. 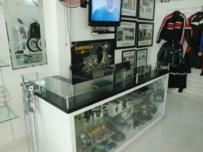 The new workshop has been setup to western standards and is the only one of its kind in Vietnam. 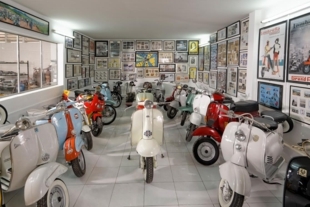 It currently houses over 75 scooters! Due to a massive increase in stock levels we have once again extended our current workshop to a new 1st level which is now our parts department. We produce over 500 different quality parts for the export market and carry tens of thousands of imported parts in stock. SSC was the first of its kind in Vietnam. 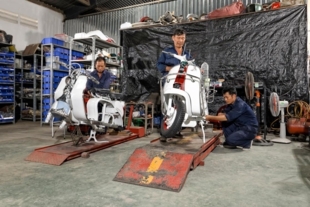 To this day many have tried to imitate our operations however, SSC is the only 100% legitimate foreign owned fully licenced Scooter Restoration business in Vietnam. 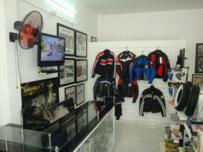 SSC has recently opened a new retail shop in District 2 An Phu district of Saigon. 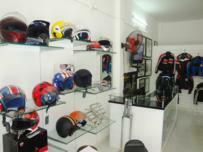 Our AP shop has an extensive range of premium Italian imported helmets, riding gear, tshirts, scooter bags, models, scooter memorabilia, dvd’s, books, magazines, parts and accessories. SSC is shortly about to launch Kingdom scooters based in the capital city of Cambodia Phnom Penh. 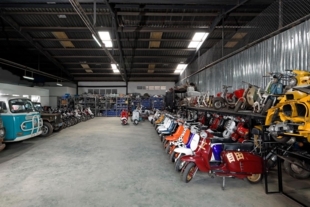 Kingdom scooters will be directly run by SSC and will be primarily offering rental scooters, scooters for sale, parts and accessories and a service centre. SSC is also the founder of Bangok Scooter Centre in 2001 . 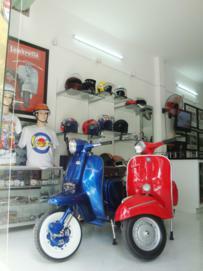 This was Bangkok first online scooter shop. We are currently relocating to new premises and will re-open later this year in the Prakanong district of Bangkok Thailand. 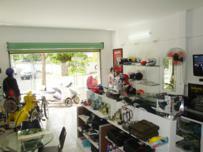 Our second workshop in Saigon which is solely catering for our rental scooters and bikes is now fully open. 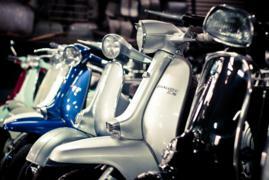 We have a wide range of rental scooters available covering many models including the classic Vespa PX through to new 2013 Honda Airblade auto’s. We have over 75 rental bikes on our inventory. 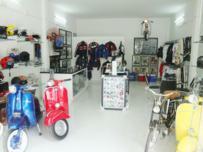 Saigon Scooter Centre New District 2 Workshop. Street 36, Khu dan cu An Phu - An Khanh, P. An Phu, Q. 2, Ho Chi Minh City, Viet Nam. Mondays to Sunday 9.00am - 5.30pm. 61 Nguyen Ba Huan street , Thao Dien Ward, District 2. HCM City.